Say SCOBY! Symbiotic colony of bacteria and yeast. What a fun class! And Kraut, Kefir, Kombucha, Fermented Salsa and Sourdough Pita. 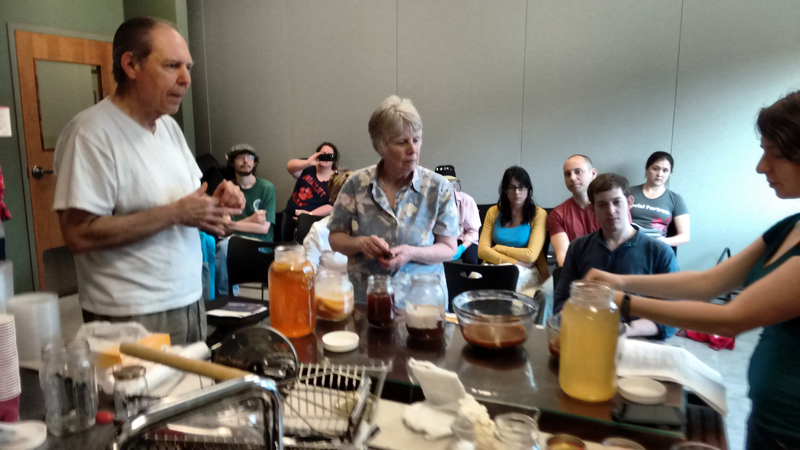 Thanks to everyone who came to Agricultural Stewardship Association (ASA) ” Can to Preserve the Land ” fermentation workshop at Honest Weight Food Co-op. I love that I get to do these classes as an outreach coordinator for ASA. We are able to reflect on the role of local land and local farms. We talked about the local produce in season and how by learning to ferment we extend our opportunities to eat local food. 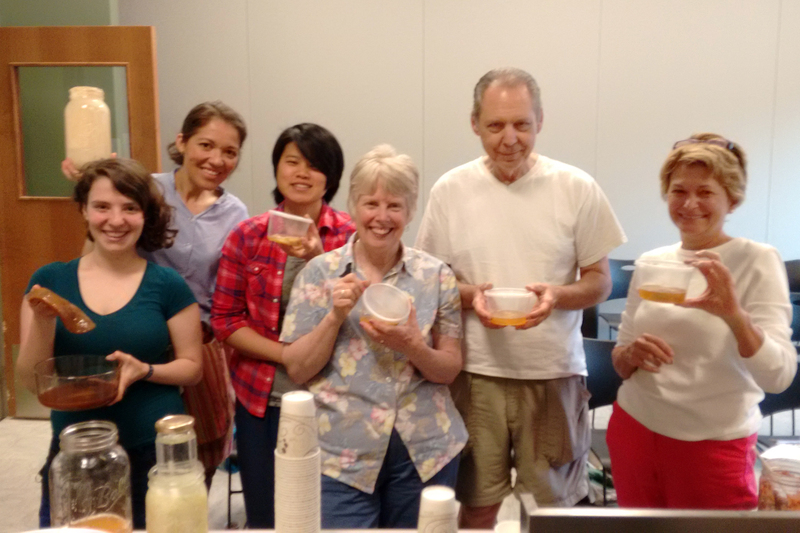 In this class, we talked about the nutritional and experimental nature of home fermentation and how the microbes do all the work to transform bland carbohydrates into sour, bubbly drinks and breads! This time I was joined by Caren Irgang, RPI-Sage Hillel Civil Engineering major. She said that being a “hungry all the time” college student is only part of the motivation to learn about cultures. For me, a cook, experimenting with fermentation, I love the unique nature of working with cultures and partner with them to create delicious and nutritious foods. As my family and I eat these foods, we are engaged by the produce and the environment around us. The process is as exciting as the outcome. 1. Mix starter, flour and water and mix for 5 minutes. 4. Let dough rise in a oiled bowl for about 2 hours. 5. Divide dough in 8 balls, roll out and bake on a pizza stone on a preheated 500F oven for 2 minutes on one side and turn and bake one more minute on the other size. 6. If storing, let it cool, keep air thigh, it freezes well. Pulse in a food processor until finely chopped, or dice by hand: tomatoes, peppers, onion and cilantro and garlic. Pour into quart of half gallon size mason jars, leaving about an inch of head space, and secure the lid tightly. Leave on the counter for approximately 2-3 days and taste to desired flavor. Burp your jars daily to release built-up carbon dioxide. This salsa will keep up to a few months in the fridge. The flavors will actually intensify over time. * If you are using whey use only 1 tablespoon of sea salt and add 2 tablespoons of whey. 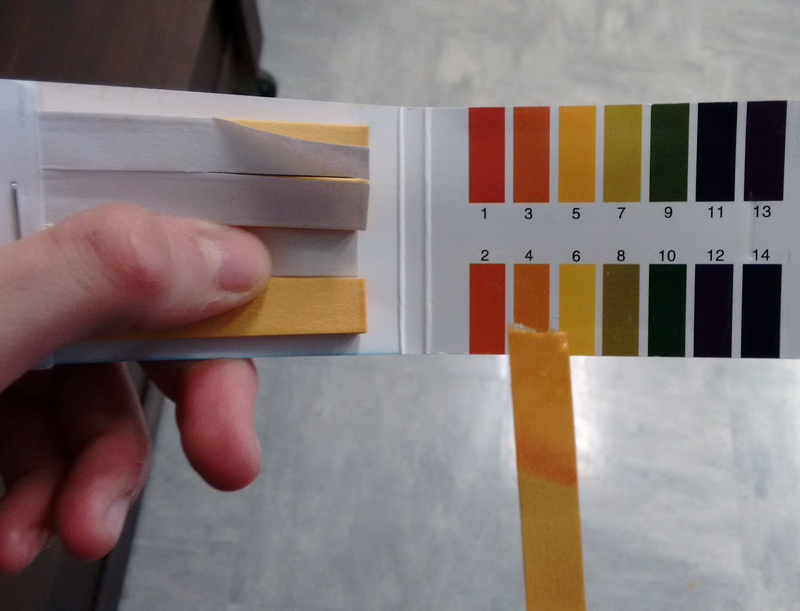 Caren tested the ferment I brought from home for the class to taste using PH strips she ordered online. All good and ready to taste! Melt the sugar in boiling water, and then add some cold water to cool it off and fill up the jar. But I like the water to be a little warmer than room temp when I put the grains in. Whenever I wake them up from hibernation it takes several batches of sugar water to get them going. Dehydrating is very easy. I just spread them out on a piece of parchment paper, on a cookie sheet, for a few days until they are hard. They will shrink quite a bit, but plump right back up when you put them in the sugar water. This sounds like a fun class, and I am happy you chose one of my recipes to use. 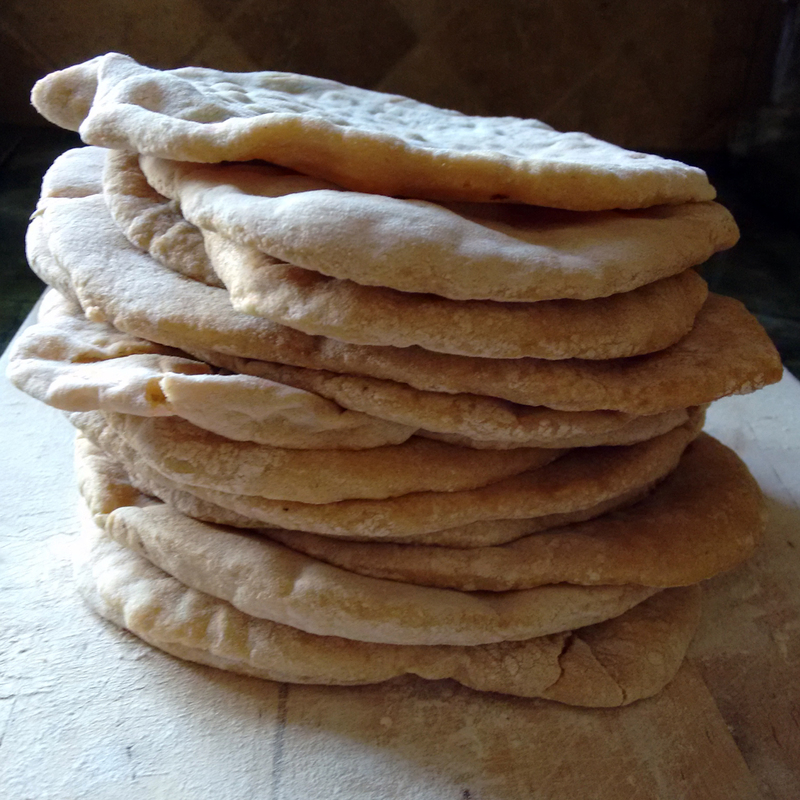 I make the sourdough pita bread often, and I had some the other day for lunch. 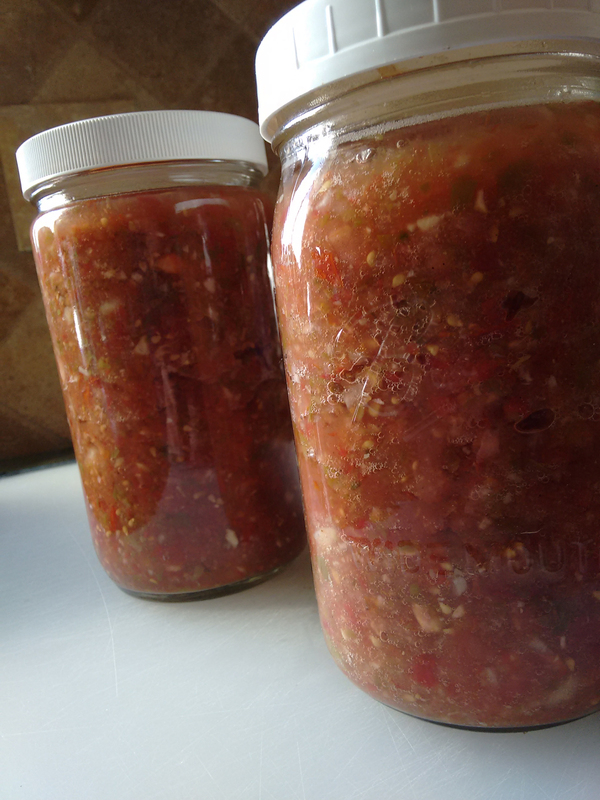 I love fermented foods and I’ll have to try the salsa when our tomatoes are in season. Hi Dave, thanks for stopping by. I really like your pita recipe and have a batch rising now. I also use it for a quick thin crust pizza. Delicious! Yes, we wanted to show how we can use our seasonal produce to make salsa and kraut. I am still eating ferment from last year’s harvest!